Most of us have heard how some foods are high in antioxidants, like blueberries, cherries and other produce. 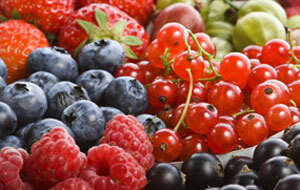 But do you know the role that antioxidants play in helping to maintain a healthy body? Our bodies naturally produce some antioxidants, like copper, manganese and zinc. Antioxidants help neutralize free radicals—toxic byproducts of natural cell metabolism. Did you know that free radicals can also be introduced into the body by exposure to cigarette smoke and pesticides? Free radicals damage healthy cells via oxidation, and oxidation is suspect in the development of some diseases. Because of aging, and the decline in our bodies naturally producing antioxidants, it’s a good idea to supplement your body with foods that are high in antioxidants. Some great foods that contain antioxidants include: apples, artichokes, avocados, black beans, blackberries, blueberries, kidney beans, pineapple, pinto beans, spinach, strawberries, sweet potatoes, walnuts and so many more foods. In addition to offering high antioxidant content, many of these foods also offer other health benefits, such as being high in fiber, minerals, protein and other vitamins, as well as being low in cholesterol and saturated fat. By choosing foods that are rich in antioxidants you can reap the many health benefits they offer.